In my last post, I shared with you the adorable birdhouse pendants that I purchased from Heather Alexander's soon-to-close Etsy shop, Art by Heather. I have made a few more birdhouses myself to add to the neighborhood! Heather sells kits for making the pendants, including the wooden pieces, collage ephemera, screw eyes, and directions. I used some of my own postage stamps, and inked rubber stamped images to some of the bare wooden surfaces using black Staz On ink. I stamped the underside of the roof and the bottom of house itself, as well. Heather's directions call for drilling a little circle for the door to the birdhouse, but I tend to stay away from power tools, so I simple created black Sharpie circles for my doors. I ordered some ball chains from her other Etsy shop, Art By Heather Supplies, so I will have three new completed necklaces. My daughter Katy calls the owl image above "Hedwig" from Harry Potter, and wants it for herself! I've already let my husband know that I'll be looking to him to cut some more wood pieces so I can make some more of these adorable birdhouses. Be sure to swing by Heather's two Etsy shops for some deep discounts on beautiful art and awesome supplies! A long, long time ago, I bookmarked a link to Heather Alexander's Etsy shop, called Art By Heather, where she sells the very cutest wooden collaged birdhouse pendants. I was poking through my old bookmarks recently, and discovered that she is closing her shop on December 15! I quickly placed my order for a couple of her adorable birdhouse pendants, along with a kit that will allow me to make a few of my own. What a delightful package to receive in the mail this past week! Along with the two birdhouses, which I absolutely adore, I also ordered a writer's pendant. I am very interested in applying myself more diligently to my writing, and I thought: why not encourage myself with a little writer's talisman? I have become quite smitten with typewriters of late, and have created an entire Pinterest board in their honor, so this typewriter charm was especially compelling! So now I have the happy task of using Heather's kit to create some birdhouse pendants of my own. I'll be back another day with the results! I encourage you to take advantage of Heather's impressive store closing sale on her two Etsy sites. One shop is focused more on her own finished art pieces, and the other shop provides a really exciting collection of collage, assemblage, and jewelry supplies. I've just now placed my second order with Heather to her supply shop. Be sure to place yours before the 15th! For those of you who didn't pick up on it, the title of my post comes from an awesome little song by They Might Be Giants that always reminds me of my high school friends. Take a moment to watch the YouTube video here. Last Saturday, we celebrated my older daughter's sixth birthday with an Octonauts-themed birthday party. The Octonauts is one of Katy's current cartoon favorites, because for years she has been in love with sea creatures, and the program takes place under the sea. A team of animals--a cat, a polar bear, a rabbit, an octopus, etc.--live aboard the Octopod and ride around in vehicles called GUPS, offering medical care and rescue to ocean creatures in need. Because Katy had a sea creature theme for her last birthday party, adding a few Octonaut-specific details was no problem; mostly it was the same party all over again! I made the happy decision to skip the crepe paper streamers this time around, and instead I sewed together die-cut fish from the parent/teacher store to make garlands for the doorways. A total of eight children came to the party, including my own two. What a perfect number! It felt less like a stressful party, and more like a comfortably large play date. When the girls first arrived, they settled down to a pile of Octonaut coloring and activity pages, which I was able to print out from Octonauts.com and 1plus1plus1plus1equals1.net. When it was time for games, we played Captain Barnacles Says (like Simon Says, but renamed for the main character of the Octonauts). I started out as the leader, and then each of the girls took a turn. We also played Pass the Tweak (a version of Hot Potato, using my younger daughter's stuffed bunny). A "fan favorite," though, was Pin the Eye Patch on Kwazii. I used a picture from Etsy to make my own Kwazii poster, and cut eye patches from black construction paper. I had a paper mask to cover their eyes from a Pin the Tail game we played earlier this year, but you could cover the kids' eyes with a scarf instead. I put the girls' names on their eye patches on little round stickers so they could see who got closest. Finally, we played a fishing game. 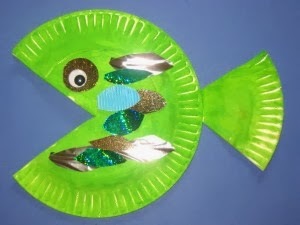 I put paper fish numbered with 1s, 2s, or 3s into a children's wading pool with paper clips attached. The girls all used a fishing pole with a magnet attached to draw out a fish. Then they could get a party favor from the bag labeled with the same number as the number on their fish. I borrowed a fun little treasure chest from a friend to store the favor bags. I set out some munchies, like a bowl of goldfish crackers and Swedish fish, and a bit of a sea-themed tablescape in the kitchen. I also made a fun dessert to serve with the kids' lunch. The idea apparently came from Martha Stewart, but many folks who've done Octonaut themes for their kids have done something similar. I made blue jello in little clear cups from the dollar store. Then I cut a slit in the top of the jello and tucked in Swedish fish to make them look like they are swimming around. Don't put the fish in too far ahead of time, though. They get terribly gunky after they've been in there for awhile! On the rest of their Captain Barnacles plates, the girls found shell pasta, dolphin-shaped cheese sandwiches (made with a cookie cutter) and "fish eyes" (grapes). Some people put more time and thought into the cake than any other part of the event, but I admit that for us, it got the least attention. I didn't even order enough in advance to get a theme-appropriate cake! But the cake had balloons, and absolutely delicious frosting, so I was content. I always serve the little ice cream cups sold in the freezer section of the grocery store to avoid the mess of trying to scoop out ice cream next to the cake. Back to the vinyl tablecloth on the floor, the girls seemed pretty happy with the cake and ice cream part of the party! We finished up the party by opening gifts, and sending the girls off with balloons and goody bags. I was able to print out pictures of the Octonaut characters onto adhesive-backed papers to turn them into stickers for the bags. I used the same sources as for the coloring pages at the beginning of the party. All in all, it was a very happy birthday party for my little girl! There are few things better than being able to complete a task and say "Finally!" For example, I finally made a trip to the post office with a big stack of stitched paper and fabric postcards to send to destinations all around the United States, and to New Zealand and Argentina. This post office trip has been a long time coming, and I am hoping that this batch will get me to other side of my mail art inertia! Finally! They look much better displayed on my wall than piled up waiting to be hung. Finally! There are some blank pages in the back that I might choose to play around with at a later date, but for now the Art Journal Round Robin is complete. Finally! I always enjoy articles, blog posts, and pins about upcycling projects that turn "trash" into fabulous storage containers and display ideas. But whenever I try similar projects, they are a distinct "fail." For example, I've tried turning cereal boxes into magazine holders--a much-beloved upcycling project--and they really just turn into lopsided half-savaged cereal boxes that I've tried to shove my magazines into. Not a good look. But I managed a little upcycling project that actually pleases me....finally! Simple and sweet, don't you think? Now, as I leave these tasks behind, my daughter's sixth birthday party looms on Saturday. There is much gift wrapping, house decorating, and food preparing to be done in the next couple of days. When I get to the other side of it, I will share with you some photos of a what an Octonauts-themed birthday party is all about! I am not usually a fan of "cutesie"-style illustrations, but I picked up a little book from a recent book sale entitled Who Finds a Friend Has Found a Treasure (and other proverbs) published by Laurel Library. I savaged the book for collage fodder before taking note of the author or illustrator. In this case, I was drawn to the "cute" little children offering each other tokens of friendship, with platitudes to match. I created stitched patchwork background, and added the illustrations to create these patchwork paper postcards. I enjoyed going into my paper stash to find colors and patterns that matched the spirit of the illustration and looked fun together. And, of course, I always love an opportunity to "go to town" with my sewing machine! Looks like I have some postcards to address and get out into the mail! I love the filmstrip embellishment above, which shows the pictures she's adhered behind it. And I really enjoy the picture of the homes climbing up the mountainside on this card. Many thanks to Sue for these beautiful cards! Many thanks to Sue for getting me closer to my goal of catching up with my mail art!